A look at Adele's live show that is as conventional as her music. Since Adele is so open on her albums, I will begin this review with an honest statement: I don’t care for Adele’s music. Yes, her voice is unbelievable and her everygirl personality is refreshing, but musically and artistically I find her a bit dull. In fact, one of my favorite pieces of music writing of 2011 was ex-Arab Strap singer Aidan Moffat’s withering Quietus piece on “Someone Like You” (look it up; it’s worth more than the energy it takes to type “Aidan Moffat Quietus” into Google). I tried putting personal opinions aside when watching Live At The Royal Albert Hall and listening to the accompanying CD. Although the experience taught me that Adele is an engaging enough performer, the overall sensation remained one of boredom. Amy Winehouse, before she devolved, emanated sass and sadness; she compelled in a live setting. Despite possessing a blazing voice, Adele is at her liveliest when bantering between songs. Performance-wise, she does little more than sway. Likewise, her backing band lacks the swagger of Winehouse’s Dap Kings collaborators. However, Adele’s devotion to her audience is refreshingly genuine and, apart from her voice, the most intriguing part of her performance. When the big hits come, she surrenders the mic to the audience, who sing the choruses of “Someone Like You” and “Rolling in the Deep” (the set’s mighty closer) word for word. The latter song’s force, however, is slightly marred when the heavens open to pour down gold confetti. For a song filled with such hurt and vengeance, the gesture feels a little out of place. Due to being only two albums deep into what looks to be a prosperous career, the Royal Albert set is heavy on covers. Of the lot, her versions of Bonnie Raitt’s “I Can’t Make You Love Me” and Bob Dylan’s “Make You Feel My Love” (sung in tribute to Winehouse) are the most successful. Both seem deeply heartfelt, like Adele understands, and is the only one who can make these words that are not hers ring true. A cover of The Cure’s “Love Song” is rendered enough to make it seem an appropriate choice, yet is too drawn out to make much of an impact in a live setting. Her cover of The Steeldrivers’ “If It Hadn’t Been For Love” seems more valid, as Adele does her best to give recognition to one of an act far lesser known than she. However, it also makes one wish that Adele would get back to us when she her sole focus becomes singing murder ballads. 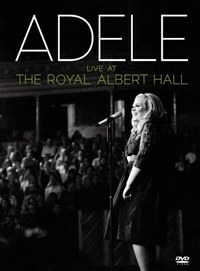 Much like Adele’s music, the concert footage is very conventional; Adele and her band are framed artfully, and the rapturous audience is shown frequently. Extras are scant, but a ten minute featurette gives a nice look behind the scenes and shows Adele at her everygirl best, expressing her pre-show nerves and an authentic appreciation of her fans love for her fans. A live CD that omits the between song banter is included in the release, as well. Without Adele’s wit to carry them, proceedings are nearly saved from being background noise by Adele’s mighty vocals, which feel even more impeccably crystal clear without the aid of the live DVD’s visuals. Yet, the fact that Adele does have talent is as clear as those vocals; one just wishes she would convey her skills in a way that is a little less... wet.